These durable workhorses have large platforms for convenient loading. Designed to hold big loads up to 600 lbs. Easy maneuvering handles. Utility Trucks with chrome handle. 5" heavy-duty plate casters that are bolted to molded-in metal backing plates, for years of trouble-free utility. Utility Trucks with molded handle. 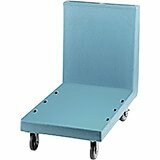 5" heavy-duty plate casters that are bolted to molded-in metal backing plates, for years of trouble-free utility. 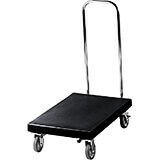 19-3/4 " x 32-1/8" x 38-1/2"
These durable workhorses have large platforms for convenient loading. Designed to hold big loads up to 600 lbs. Easy maneuvering handles include a tough, chrome handle. All models have 5 heavy-duty plate casters that are bolted to molded-in metal backing plates, for years of trouble-free utility! These durable workhorses have large platforms for convenient loading. Designed to hold big loads up to 600 lbs. Easy maneuvering handles include a built-in, molded handle. All models have 5" heavy-duty plate casters that are bolted to molded-in metal backing plates, for years of trouble-free utility! 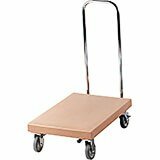 These durable workhorses have large platforms for convenient loading. Designed to hold big loads up to 600 lbs. Easy maneuvering handles include a built-in, molded handle. All models have 5 heavy-duty plate casters that are bolted to molded-in metal backing plates, for years of trouble-free utility!